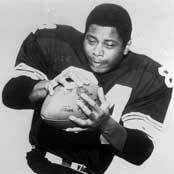 As a high school athlete, Tony was an All-American selection in football. He also played baseball and won the team’s MVP and All-American, and was drafted by the Pittsburgh Pirates to play professional baseball. Tony is a graduate of the University of Nebraska where he was the First Academic and Athletic All-American in the history of the University of Nebraska. His selection as an All-American football player was both as an offensive and defensive end. In addition to being a two-time All-American, he was a three-time All-Big Eight selection who played and was selected MVP in two Orange Bowls. After his senior football season (10-0), Tony was chosen as the MVP of the Nebraska Football Team. He has since been inducted into the Nebraska Sports Hall of Fame. Drafted by the Green Bay Packers, Tony was traded to the Pittsburgh Steelers where he played as a tight end for four years until a back injury ended his career. He then attended the University of Pittsburgh for his graduate work in business. Tony presently heads his own organization, A. Jeter & Associates, an international management consulting company specializing in executive development and training. He frequently lectures and participates in charity events designed to inspire and uplift today’s youth.